Middle School Students bring their personal laptops to school each day. Please see the Technology Requirements for the “Bring Your Own Device” program. The academic program of the middle school provides education in the liberal arts and sciences and stresses creativity, independent and collaborative thinking, writing, critical reading, and character education. It prepares students for high school through a challenging and nurturing academic program. The school underscores its commitment to our students in a community that is grounded in faith, moral responsibility, and academic excellence. The faculty provides an effective, safe, and controlled learning atmosphere and provides support for each student. The middle school language arts program is a cohesive, four-part curriculum. The program is centered on the study of grammar, composition, vocabulary, and literature. It addresses both written and oral abilities. Middle school students are assigned novels of various genres to be read during the summer and throughout the school year. Creative and critical writing assignments focusing on expository, narrative, persuasive, and descriptive formats accompany each unit of study. In seventh grade, Latin and Greek root words are explored to strengthen vocabulary and sharpen analytical skills. An honors language arts program, based on a student’s standardized test results, teacher recommendations, and grades is available to middle school students. The middle school math program fine tunes students’ computation skills and develops the ability to problem solve. Students are encouraged to think and to gain confidence as mathematicians. At Grace, students are placed in 7th grade standard math, pre-algebra or algebra. Math placement is based on standardized test results, teacher recommendations, and grades. All students completing algebra and planning to attend public high school are required to take the End of Course exam to receive high school credit for the algebra class. The seventh grade course affords an in-depth look at life science, specifically cells and heredity, including genetic disorders, viruses and bacteria. Students explore the concepts with interdisciplinary connections in history, geography, technology, and the arts. Lab work integrates collaborative learning and a “hands-on” approach to discovery. Seventh graders also study the nature of science through a 9-week forensics unit. Health topics include building self-esteem through successful decision making, developing a positive balance between physical, emotional, mental, and social health, as well as goal setting. The curriculum also includes a human growth and development component that is gender specific when appropriate. 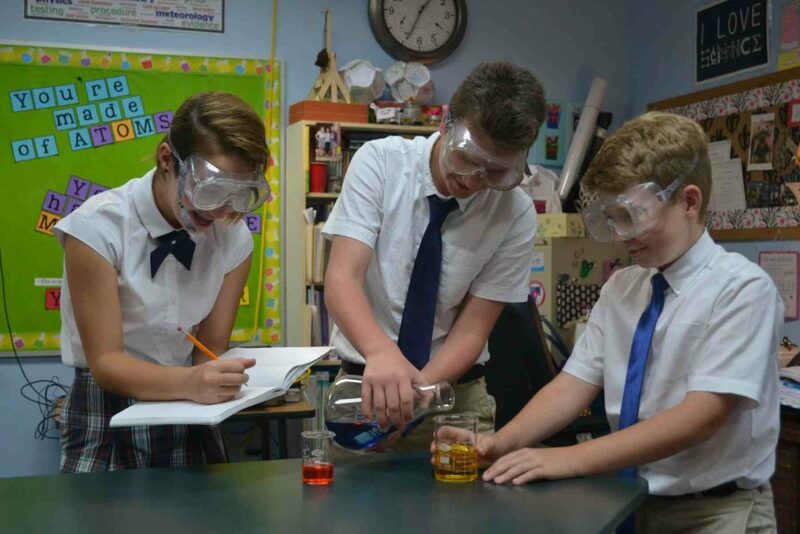 The eighth grade focuses on the study of physical science. Topics include chemical building blocks, motion, forces and energy, sound and light, and electricity and magnetism. Laboratory investigations apply and extend key concepts. Health concepts stress healthy relationships with families, the community, and friends. The ill effects of tobacco, alcohol, and drugs are taught, as well as the effects of infectious and non-infectious diseases and disorders. The seventh grade social studies program concentrates on World Geography. Students will learn about the people, places, and environments of different countries in the world. The eighth grade social studies program concentrates on American History from the Exploration and Colonization period to the Reconstruction period following the Civil War. In seventh grade Spanish, students become familiar with the lifestyles and elements of culture from Spanish speaking countries. In addition, students will further their Spanish vocabulary and be introduced to basic Spanish grammar. This course is the equivalent to the first part of Spanish I at the high school level. Eighth grade students learn to use Spanish in everyday conversational settings. Students also explore the various cultures of Spanish speaking countries, in addition to learning to speak, read, write, and understand Spanish at a beginning level. There is an emphasis placed on expanding the students’ Spanish vocabulary along with learning new grammar concepts. This course is equal to Spanish 1 at the high school level and is aimed to prepare students to enter into Spanish II as high school freshmen. Our middle school curriculum reinforces Christian values and meets students “where they are” at this time in their life. Lessons are relevant, geared to life application, and instruction is across the curriculum. Technology is incorporated into our Middle School curriculum on a daily basis and is designed to help prepare our students for the future. Students participate in our “Bring Your Own Device” program and bring their personal laptops to school each day. Please see the Technology Requirements for the “Bring Your Own Device” program. Our focus is to enrich and expand learning opportunities, incorporate project-based learning, and promote creativity, problem-solving, and collaboration. We also emphasize Digital Citizenship, research, and communication skills. Our middle school performing arts program teaches our students three aspects of music: music theory, history, and performance. Our students learn a functional overview of music notation, music performance and important historic musical figures and their roles in shaping music. Students also study public speaking. Middle school students participate in team activities, as well as individual activities, to improve their health, their knowledge, and their character. Students learn skills, rules, and team interactions for each sport or activity. Some of these activities include flag football, volleyball, and the Presidential Fitness Challenge. In addition to the core classes, the middle school curriculum offers electives twice weekly. Students have the opportunity to participate in band, an art elective, or study hall.